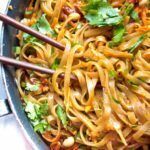 These Sweet and Spicy Noodles are a Thai inspired fast, easy weeknight dinner that can be ready and on the table in just 20 minutes! Bring a large pot of water to a boil and cook noodles until al dente, approximately 6 minutes. Meanwhile, prep your veggies / garnishes. In a small bowl mix soy sauce, hoisin, honey, chili garlic paste, garlic, and red pepper flakes. A couple of minutes before the noodles are done, in a large saute pan, heat sesame oil over medium heat and add sauce and stir, cooking garlic. When noodles are done, drain and add immediately to pan with sauce and stir until the noodles are well coated. Top with carrots, peanuts, cilantro, green onion, and Sriracha. Mix and serve!